Dr Paul Lam, a family physician, and tai chi practitioner and teacher for over 40 years, is a world leader in the field of tai chi for health improvement. Dr Lam is now focusing at preventive health. He worked with a team of tai chi and medical specialists to create several Tai Chi for Health programs since 1997. They are easy and enjoyable to learn, bringing with them the many health benefits safely and quickly. Since then, medical studies have shown are safe and effective to improve health. By 2016, over eight million people around the world have learnt the programs for health and enjoyment. The Centers of Disease Control and Prevention (www.cdc.gov) recomends his Tai Chi for Arthritis for Fall Prevention program. National Council On Ageing; Arthritis Foundation of USA and Australia, Arthritis Care of UK, Diabetes Australia, Osteoporosis Australia and other similar organistaions, fitness associations, universities and hospitals around the world supported one or all of Dr Lam’s Tai Chi for Health programs. His instructors’ training workshops are accredited by Arthritis Foundation of USA; American College of Sport Medicine, Australian fitness industry; American Council of Exercise; American Tai Chi Assocation; Florida and many other physiotherapist associations, HK rehabilitation society and the Korean Rheumatology Health Professional’s Society. In 2010, Dr Lam and his colleagues have established the Tai Chi for Health Institute to empower people to improve their health and wellness using the Tai Chi for Health programs. Dr Lam’s instructional DVDs and books have made learning the programs easy and enjoyable. Dr Lam’s team have also produced other tai chi instructional DVDs for learners of intermediate and advanced levels. You can find more information online. Many of Dr Lam’s students excelled in promoting health improvement and international competitions. Dr Lam is fluent both in English and Chinese. He enjoys working to bridge the gap between orthodox and alternative therapise, eastern and western cultures, traditional and modern Tai Chi stylists. Dr Lam practices Yang, Chen, Sun styles as well as other tai chi sets of combined styles. He has begun his Tai Chi journey with his late father-in-law Mr Lum Win Gwei who was a student of Yang Zhou Zhong (Eldest son of Yang Chen Fu who is the grandson of the creator of Yang Style Tai Chi). With the encouragement of Mr Lum, Dr Lam has also studied with several prominent teachers in China. Dr Lam believes medical research is the best way to show how effective tai chi is for health improvement. More medical evidence will bring more governmental support which will help spread tai chi to more people. Dr Lam has integrate his medical, tai chi and research knowledge to participate in research projects around the world. 24 of his research papers are published in peer reviewed medical journals. He has been contributing to medical research of the topic tai chi for health improvement in the capacity as chief investigator, co-investigator, consultant and advisor. Click here for a list of 24 published studies by Dr Lam, this link for all 35 studies done thus far for Tai Chi for Health Programs. Contact Dr Lam for more information, advice or technical support for tai chi research. 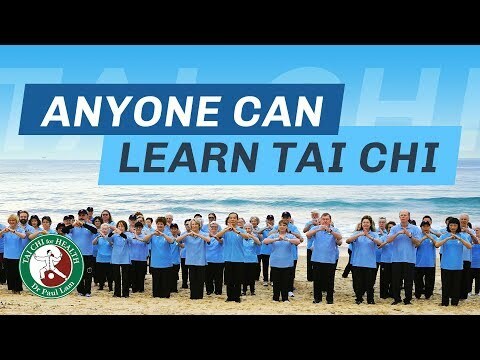 Tai Chi for Arthritis is a special program created in 1997 by Dr Lam and a team of Tai Chi and medical experts especially for people with arthritis to improve their conditions as well as wellness and balance. It is supported by many Arthritis Foundations around the world. In 2001, Dr Lam and his colleagues created the Tai Chi for Diabetes program and later in 2004 the Tai Chi for Back Pain. Tai Chi for Osteoporosis is designed to build strength, improve balance and better health. This two part program can enhance quality of life and reduce the risk of falls. Tai Chi 4 Kidz is a fun activity to develop children’s concentration and coordination. Dr Lam and his colleagues believe prevention is better than cure, so they are focusing on prevent illness, improve health and wellness with the two new programs: Tai Chi for Beginners and Tai Chi for Energy. Dr Lam has practiced as a family physician in Sydney, Australia for 40 years. He has refocused in 2013 to fully engaged the Tai Chi for Health Programs. He graduated from the University of NSW on a university scholarship in 1974. Dr Lam has been teaching post graduat family physicians and a clinical lecturer in the University of NSW for over 30 years. In 1997 Dr Lam realized the need of a specially designed Tai Chi program for people with arthritis, his team of Tai Chi associates and medical specialists created the 12 movement Tai Chi for Arthritis program based on the Sun style. The program is now adapted by the Arthritis Foundation of USA and supported by Arthritis Care of UK, many arthritis foundations worldwide. The program is being taught through authorized instructors; instructional DVD (in English, Chinese, Korean, Spanish, French, Italian and German) and a book “Overcoming Arthritis”. Several scientific studies have shown the program effective in relieving pain, improve physical function and is safe to learn. In 2001 Dr Lam’s team created another program of Tai Chi for Diabetes, this program consists of a simple set of tai chi based on the Sun and Yang styles designed to help prevent and improve control of diabetes. This program is different but complementary to that of Tai Chi for Arthritis, It is supported by Diabetes Australia. In 2004 he has created Tai Chi for Back Pain based on the Tai Chi for Arthritis program. In 2005 he has created Tai Chi for Osteoporosis based on available scientific evidence to build strength and prevent falls. Other programs includes Tai Chi 4 Kidz and Tai Chi @ Work; Tai Chi for Beginners, Tai Chi for Rehabilitation and Tai Chi for Energy. Dr Lam has collaborated with Arthritis Foundations, Diabetes Associations, Univerisities and hospitals, fitness associations, Rehabilitation Society and the Rheumatology Health Professional’s Society to conduct instructor’s training workshops around the world. These workshops are accredited by many organisations including American Council of Exercise; American College of Sport Medicine, Australian Physiotherapy Association; Florida and many other physiotherapist associations and Tai Chi union of Great Britain. Dr Lam has presented annual tai chi workshops (of one week duration) since 1998 in Sydney Australia and USA. This workshop offers many courses from beginners to advance and is attended by people from many countries. Click here for a list of upcoming workshops by Dr Lam and his authorised trainers. Dr Lam writes a monthly newsletter free to any email subscribers, it contains Tai Chi information, health and better lifestyle ideas. Click here to subscribe. He is the co-author of the book “Overcoming Arthritis” with Judith Horstman, Tai Chi for Beginners and the 24 Formswith Nancy Kaye and Teaching Tai Chi Effectively. The latest book “Born Strong” his memoir is now available through Amazon or www.taichiproductions.com. Keynote speaker invited by National Arthritis Foundation of Singapore and People’s Association Singapore 2011 and 2010. Invited speaker of the Australian Annual Rheumatology conference 2008 in Adelaide on the topic of Tai Chi for kids and osteoporosis. Invited speaker and chair of the Tai Chi and exercise section of the 3rd International Complementary Medicine Research Conference 2008 in Sydney. Invited speaker at University of Bologna – the world’s oldest University in Italy 2008. Speaker on “Tai Chi for Back Pain” at the 5th interdisciplinary World Congress on Low Back and Pelvic Pain in Melbourne November 2004. National Conferences of the National Association for Gentle Exercise Leaders 2000 and 2001. Australia Chinese medical association’s annual scientific conferences. Also many other conferences invited by arthritis Foundations, diabetes foundation and organisations, universities, health department and medical professional around the world at international, national and state levels. Dr Lam is the founder of Better Health Tai Chi Chuan. From its beginning over 30 years ago, thousands of students have graduated from the school, which has expanded to now include 18 instructors. A number of Tai Chi schools in Australia are affiliated with the Better Health TCC. Later on he founded the Tai Chi Association of Australia to share knowledge and promote tai chi in Australia. Dr. Lam has taught thousands of tai chi instructors and participants; many of them have been successful at international competitions. He is highly sought after for teaching, presenting Tai Chi seminars and workshops. Dr Lam gained governmental accreditation as a nationally accredited sport coach and has been invited to join the judging panels of many competitions. Dr Lam is the producer of a comprehensive series of Tai Chi instructional DVD from beginners to advanced. These products are distributed worldwide through major retail stores. Many people have improved their health and lifestyle, and their skill of tai chi through using these videos. At the Third International Tai Chi Competition in Beijing (1993), Dr Lam won a gold medal for the Combined 42 Competition Forms, as well as two silver medals for the Combined 42 Tai Chi Sword Forms and the Chen Style Forms. The products are useful to improve user’s health and tai chi skill. The quality of these productions has won approval from users worldwide. Dr Lam is committed to promoting Tai Chi for health improvement. He has combined his knowledge of medicine, Tai Chi and sport coaching to further this purpose. New projects include conducting workshops in more countries, training more trainers and research of the health benefits of Tai Chi.